Finger food - oh yes, I do like finger food. Something that is easy to eat while doing at least two other things - drinking and talking, and at times, listening too. I think perhaps proscuitto is the omnivore hors d'oeuvre maker's best friend. 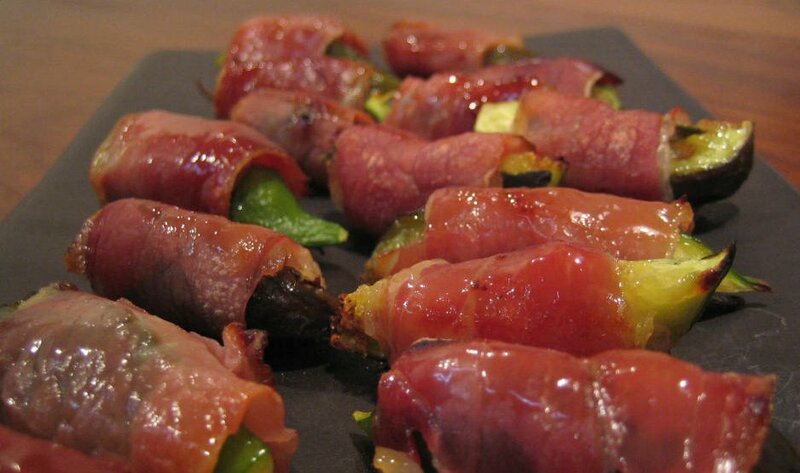 Is there much that does not benefit, in the finger food arena, from being wrapped in proscuitto? Fruit, cheese, fish, vegetables, bread or indeed just proscuitto all by itself. Proscuitto is air dried ham - a specific, well known type is Parma ham, being from Parma, Italy. Many countries make a form of raw air dried ham, with perhaps Italy the most celebrated. It takes a long time to turn crude pork into proscuitto ; first the washing, then the salting, then the rising and the drying. There are no synthetic chemicals involved in the production of proscuitto , just salt, air and time. Proscuitto is most often sold in very thin slices with pure white fat streaking down the side of each slice. The combination of fig and sage wrapped in proscuitto was not difficult, but was a new one for me. It is hard to be specific in the quantities, but rest assured that any left over proscuitto will not go to waste (see above). Lay a sage leaf on each fig quarter and wrap with a strip of proscuitto. The amount of each ingredient is only dependant on your taste. Place on a grill pan seam side down. Grill for about 10 minutes or until the proscuitto is crisping and turning brown and delicious. Turn over part way through. The figs will become wonderfully sticky, sweet and caramelised - just perfect with the salty-savoury proscuitto.